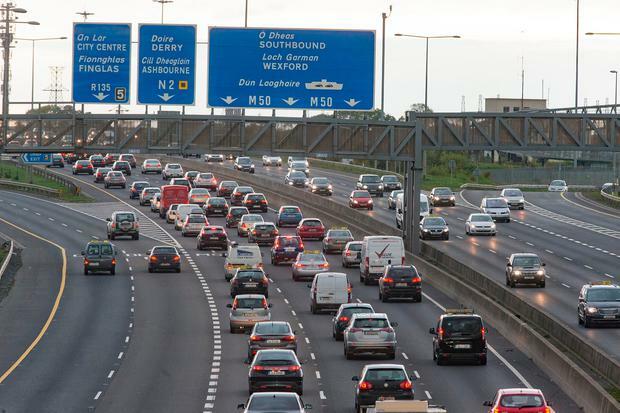 Transport bosses are preparing to introduce additional tolling points on Dublin's M50 if the Government decides drastic measures are required to tackle congestion. Transport Infrastructure Ireland (TII), which operates the country's busiest motorway, has sought tenders to operate the tolling system from 2019, and operators must be able to collect tolls from a number of locations. Documents show more than €1bn will have been collected in tolls and late-payment penalties between 2008, when toll barriers were removed, and 2019, when the current tolling contract expires. Some 130,000 vehicles a day currently travel over the tolled section of the 42km road, between junctions 6 and 7. But growing traffic numbers has resulted in parts of the motorway carrying more vehicles that the road was designed to accommodate. TII chief executive Michael Nolan last year told the Public Accounts Committee the "main solution" would be "demand management" in the form of multi-point tolling, where vehicles were charged across a number of locations. But he said it was a matter for Government, which has ruled out the move until public transport services improve. A TII spokesman said a number of measures were currently under way to manage traffic. These include the introduction of variable speed limits, where the upper limit falls when traffic volumes are high, coupled with lane controls and real-time traffic information. They said TII had been instructed not to progress multi-point tolling at this point. "We've included the provision for multi-point tolling in the event it is required in the future and would therefore not be an additional cost for implementation," the spokesperson said. "This does not mean it is happening. It is in case of future potential to reduce incurring costs." In January 2006, the National Roads Authority (now TII) announced it planned to remove the toll barrier during a €1bn upgrade of the motorway, making it freeflow. By 2019, the toll operators will have dealt with payments for more than 420 million trips from four million customers. Some 60 million customer contacts such as phone calls and emails will have been processed and 40 million letters and account statements issued. The next contract, which is out for tender and will run for a decade, includes provision to include multi-point tolling if required. TII suggests this is likely to be implemented to manage demand, as required under the planning permission granted for the upgrade. "With regard to the options for new free-flow/additional toll points, the contract's provisions are primarily designed to facilitate this option on the M50 motorway," tender documents state. "The M50 option is currently anticipated to be the most likely option to be implemented (subject to ministerial approval and the statutory approvals process) because it is linked to a provision for a review of demand measures for the motorway within the statutory planning consents for the upgrade scheme for the M50 which was completed in 2010."